Ricardo Eliécer Neftalí Reyes Altobasso lost his mother at age thirteen, and the support of his father even before that. “A poet and writer in my house? Never!” he is reported to have said. What was a sixteen year old boy to do, but invent a new name: Pablo Neruda it became and remains — one of the most recognized names in literature, and a poet at that! 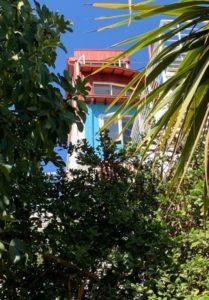 One of his homes in Valparaiso, Chile, is visited today by hundreds, patiently standing in line to take a 5 story dictaphone-guided tour of this strange and wonderful house– one of three he spent time in, while not traveling the world. A tour of a house is not a tour of the writing, of course. It would be hard to do a museum-like appreciation of a writer’s work, and this one doesn’t. We do get, in “La Sebastiana, ” a sense of the man and his whimsey, a collector’s near mania for the odd and curious from around the world — screens from China, old maps from Europe, drawings and paintings of sailing ships, an old carousel horse, china plates from England. The floors diminish in size as they go up, until the top is not much larger than a ship’s crow’s nest, from which Neruda surveyed the multi-structured valley, the bustling seaport of Valparaiso and beyond, the great Pacific ocean. and next to his bed on the fourth floor he had ship’s lamps and a sea chest, he was an honest man. “I am a sailor just of the mouth,” he said. Solid ground suited him better than sailing the oceans of the world, about which he knew a great deal, having crossed the Mediterranean and the Red Sea, the Arabian and Adaman and the Bay of Bengal as a young consul to Rangoon. (Neither did he much like the city or the British Colonial rule there.) From there he continued in diplomatic service and ocean travels to Ceylon (now Sri Lanka), the Dutch East Indies (now Indonesia), Mexico, Spain and France. Oceans enough for a land loving poet. his mission of circulating peace. 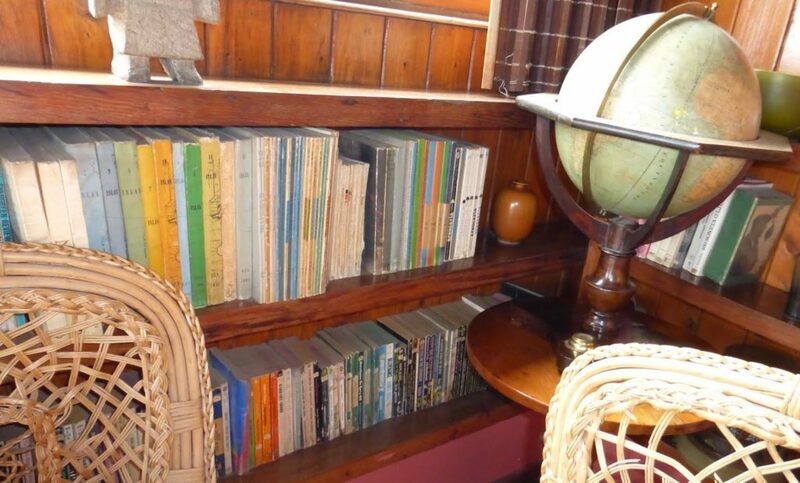 On the shelves of this room are some of his books. Poetry of course, and serious reading from Monthly Review Press, a 1960s journal of leading socialist economists. Very fond of crime and mystery, which he devoured as a young boy, there are titles by Ellery Queen, Arthur Conan Doyle and Dashiel Hammet among others. Speaking of Conan Doyle, an interesting story about the riddle of Neruda’s name may have recently been solved. Neruda is neither his given name, nor even Spanish, though he claimed to have adopted it in part because of its Spanish sound. For years he was queried about its origin. One particularly diligent investigator was convinced he had borrowed it from one Jan Neruda, a fairly well known Czech poet, journalist and writer. The problem was that no Jan Neruda books had appeared in Spanish translation before Pablo adopted the name. From where then? The poet was always evasive and uninterested in indulging this particular interest of others. More investigation by Ernesto Bustos Garrido, turned up a character by the name of Norman Neruda in Arthur Conan Doyle’s “A Study in Scarlet,” which appeared as “Un crimen extrano” in 1908, plenty of time for the detective obsessed Neftalí to have read it before taking the name himself in 1920. Even more curiously, Bustos Garrido reveals that the Neruda in the story was a woman, an extremely famous Austrian violinist and a friend of Conan Doyle’s, a nearby neighbor. How had she become “Norman?” Apparently by a translation error. In real life she had married a Swedish Opera director, Ludwig Norman, and in the style of the times, had conjoined the two names, Norman-Neruda. Though Holmes says to Watson, in English, “I want go to Halle’s concert” referring to the conductor of concert, the translator took “Halle’s” to be the name of a venue, thereby introducing Norman Neruda to the young Neftalí. Norman didn’t have the ring he wanted so he chose instead, Pablo, the name of his favorite poet at the time, Paul Verlaine. Though it would be hard to create a museum about poetry instead of about a man, I thought more might have been done. In the same room, clips of Neruda reading his own poems, might have been played, such as this wonderful reading he gave in 1947 of Las Alturas de Machhu Picchu. In another room music set to his poems might be listened to, like this immense chorale by Mikos Theodorakis, pt Canto General. In the garden a “poets corner” might have been set up with handbills and copies of poems for interested folks to read to each other, as at a “speakers’ corner.” A display of various translation, even to the same language, English, might be displayed to show the struggle and solutions arrived at, to bring such metaphors and images from one language to another. Perhaps already colloquies of writers and scholars, readings and musical events take place at “La Sebastiana;” there were no announcements of any. The very fine WWI museum in Kansas City, Mo, has small listening rooms set aside to hear poems and interviews with those who experienced that war. It was a powerful way to engage the experience of others; such voices and contemplation would be a marvelous addition to the Neruda house. Calle Ferrari stretches like a sun-soaking python down from the house, wandering past cemeteries for true believers and disidentes separated by white wall, all surrounded by non-believing trees and flowers. 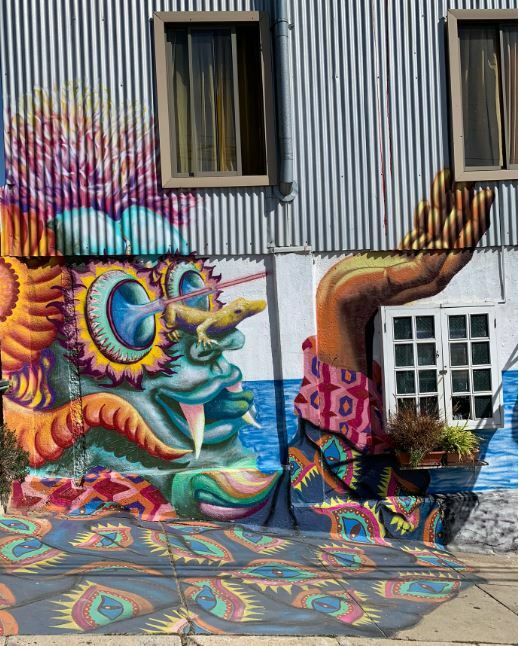 Crooked alleys and tumbling stairways are the canvases for the original wall-painting and graffiti art of the late 1960s, now called El Museo a Cielo Abierto (The Open Air/Sky/Heaven Museum,) and free to whoever will test themselves against the hills. Valparaiso, so-called by early mariners and settlers may have come from “valle del paraíso,” (paradise valley) or according to other word-worms, “va al paraíso” (go to paradise). In either case, Europeans recruited to, or desperate for, the New World, must have believed these hills and ravines running to a welcoming port, after beating through the Straits of Magellan or tossing for terrifying weeks around the horn, were indeed a Paradise. For readers, particularly those needing a break from the daily deluge of bad news these months of 2019, much is available, by and about Neruda. U.C. Press published the full Canto General, in a translation by Jack Schmitt, © 1991. John Felstiner’s Translating Neruda: The Way to Machu Picchu is a wonderful personal journey of translating Las Alturas de Machhu Pichu, Stanford, 1980. Neruda’s Memoirs, 1974, translated by Hardie St, Martin, is delightful reading. The posthumous short prose collection Passions and Impressions, 1980, tr Margaret Sayers Peden, adds to the Memoirs and deepens our well of knowledge. Or Pablo, himself, reading Las Alturas de Machhu Picchu, in 1947. And, by the way, the 2016 movie, Neruda, directed by Pablo Larraín, is well worth watching, even if you are poetry-phobic; plenty of chase and escape scenes and saucy settings. Jah: I love Neruda! Beautiful article William. Hope you guys are doing well. YES! …I’m going to print this out and re-read. I learned a lot already. There’s a beautiful “small” poem of Neruda’s no one seems to know called “A Un Escarabajo”. Always loved the simple last line: Así son los escarabajos. I’ve just looked and don’t find a translation, either. Will have to find some moments! Leave a reply on "Pablo Neruda in Valparaiso"